National Law Enforcement Officers Memorial Fund: Happy 95th Birthday, Congressman Biaggi! Happy 95th Birthday, Congressman Biaggi! Today, the founder of the National Law Enforcement Officers Memorial Fund, U.S. Rep. Mario Biaggi (ret. ), celebrates his 95th birthday. In 1960, then Lieutenant Biaggi received the New York City Police Medal of Honor for Valor, the Department's highest award (pictured above). Here are just a few more highlights from former Congressman Biaggi's impressive career. Served for 23 years as New York City police officer, retiring in 1965 as a Detective Lieutenant. 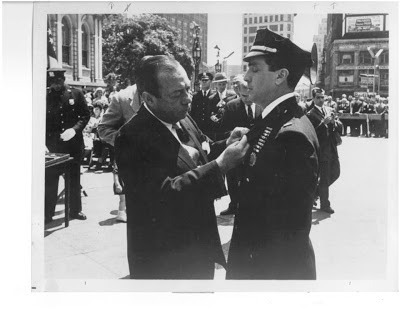 Wounded 10 times in the line of duty, and when he retired in 1965, he was the most decorated officer in New York City history. Went on to serve 20 years in the U.S. House of Representatives. Authored the law to establish the National Law Enforcement Officers Memorial, among many other legislative accomplishments. Founded the National Law Enforcement Officers Memorial Fund in 1984. Join us in wishing Mr. Biaggi the best on his 95th birthday.